"If you love what you do, it's not work". If this is true, then Jim Hoke's out of work. He's very busy, however, being Nashville's premier "go to" guy on sax/woodwinds, harmonica, pedal steel, a plethora of other color instruments, plus horn and string arrangements for a virtual who's who of every musical category. Top artists in pop, country, Americana and other styles respect Jim for the amazing level of artistry he brings to everything he does. Nashville is a town of musical specialists and Jim is a rarity - a specialist on a baffling number of instruments, and he plays each one as if it's the only thing he does. On sax, you hear the whole history of the saxophone coming through; suave Lester Young, soulful King Curtis, cool Stan Getz, melding into Jim's own contemporary style. When he plays blues/country harp, you hear Sonny Terry blues, electrified Paul Butterfield urban energy, and alot more. On chromatic harmonica, there's Stevie Wonder lyricism and Toots Thielemans innovation rolled into Jim's own style. Drawing so deeply from the well enables Jim to be the perfect stylist for any musical situation and this is the main reason for his s﻿uccess in the studio. If you've listened to an album recorded in Nashville any time in the last 30 years, there's a good chance you've heard the work of Jim Hoke. 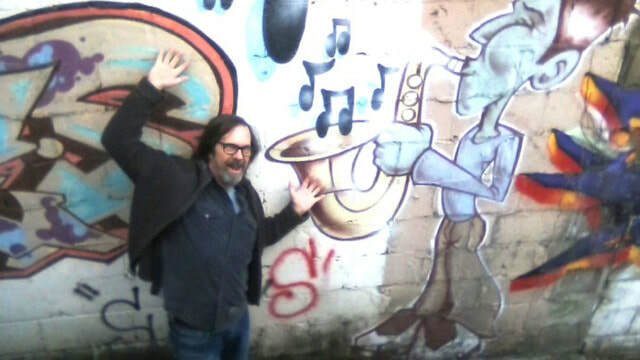 Known best for his saxophone chops, Hoke is a virtuosic multi-instrumentalist who has played sessions for artists like Dolly Parton, Paul McCartney, Emmylou Harris and Steve Earle, among many, many others. In November, Hoke released his solo album The Floating Zone. The collection of original material is built on melodies, lyrics and arrangements Hoke conceived while dreaming, hence the phantasmagoric title. Dreaminess aside, the songs are sturdy and thoughtful, showcasing longtime sideman Hoke as a vocalist for the first time in recorded form. It's worth noting, too, that Hoke plays every instrument on the album with the exception of strings and some guest contributions: Duane Eddy and John Oates also lend their talents to The Floating Zone. But it's ultimately Hoke's own vision and influences, including The Beatles, The Beach Boys and Eddy himself, that make for an intriguing album from a musical voice we're fortunate to finally hear so much more directly. I’ve really been enjoying the album, and especially love the concept of writing songs derived from dreams. What was behind your decision to plot the album that way? All my life, that’s something that's happened once in a while. I’ve never really been a writer as my main thing, although I’ve written a lot of instrumentals and I’ve had jazz groups in the past. Sometimes I wake up and there’s a big chunk of a song, enough that I can sort of round it out and finish it. It seems in the last three years I’ve been getting them more and more. The one that really made me think I should make an album is the pretty one, the one my son [Austin Hoke] sings called, “If Things Don’t Ever Work Out.” When I got that one recorded I thought, “Hmm, this is pretty good. Maybe it’s time to make a whole album and hang an album on that concept.” So, I decided about two years ago and just started recording them on my home recording rig, playing most of the instruments myself. Once you had the idea for the concept, did you revisit earlier songs that came about similarly or did you then set out to create and capture new songs from dreams? A little of both. There are one or two that I had around for just forever that I never finished. “I’m in the Doldrums” started years ago, but I never finished the lyrics. So I thought since I was making a record it would be a good time to finish that up. It seemed to fit in with the others, more or less. As far as actually being able to capture the ideas, how did you do it? Did you keep a voice recorder by your bed, or do you just have an unusually good memory for dreams? You should definitely move on those windows, because it’s a brief opportunity before you fall back asleep. I think ideas that come to you that way are, even if you’re awake and you can’t get to sleep, there’s still a lack of the judgmental part of you that likes to get in and meddle with your work. And of course if it’s a dream, you’re completely passive — you’re not the one guiding it at all. I’m interested in how that works because I’m usually not too happy with things I try to write when I’m really trying to write. I was reading an article recently about hypnagogia, which is kind of what you’re describing. It’s the state right between when you begin to fall asleep and you actually fall asleep, and you actually have access to both your conscious and unconscious minds at the same time. I wonder if there’s a way to induce that? It’s better than drugs. It’s cheaper. It’s legal. Another thing I imagine folks are excited about with this album is getting the opportunity to spend some time listening to you sing. What was that like for you, getting to put more of a focus on your vocals? It’s fun to try to make something musical happen with my voice and to try to get to the core of what I sound like. I like the fact that I’m not really trying to sing like anybody else. I’m not doing the Southern macho blues thing. I’m not trying to do the Americana slur-your-words thing. I’m not going after one of the standard vocal characterizations that are instantly recognizable. I guess it’s like the folk singing m.o. — I’m just putting it out there and hoping it sounds real. What do you think of the singing? Well I was about to bring up how much I liked the a cappella track with John Oates, “Zero Gravity.” It has all those really cool, layered vocals that you guys did. It really stuck with me. I like singing backgrounds and putting the parts together and stacking all my voices. That’s a whole different way of singing, background singing. It’s a whole different sound. You don’t want to be real inflected and passionate or anything. You have to be like a musical instrument. Then John came over and I had already demoed the parts I wanted him to do, singing them myself, then he listened to the idea and we put his three parts on there one at a time and then I added my lead. How does it compare to work on songs you’ve written for your own album and have folks like John Oates or Duane Eddy play on them, versus being on the other side and contributing instrumental work to someone else’s song?Well, the shoe is definitely on the other foot when I’m having someone over and I have an idea of what I want them to bring to my song. I’ve been a bandleader for a lot of years, so being on both ends of it, I know how to talk to musicians and put them at ease and express what I want in musical terms. Sometimes there’s that magic element that’s hard to convey in words, like Laura Nyro would ask her piano player, “Play something a little more purple.” You know, who knows what she means. So I’m comfortable in that position.With Duane, he’s just such a sweetheart, and we’re buddies and we have these nice long phone chats all the time. He remembers everything from the early days of rock ’n’ roll and he likes to talk about it. We have a lot of points of contact. He had his guitar there and I said, "Oh, would you play something along the lines of what you did on ‘Movin’ ’N' Groovin’?” I’m totally happy to direct musicians, because most musicians like to be directed. For a side person, the worst thing is when they’re working for someone who doesn’t know what they want. You’re a couple of shows into your residency at The 5 Spot. How has that been for you so far?I’m thrilled with the turnout we’ve had. We had a lot of people my age and then younger folks. My son Austin, who’s in his 20s, is in the band, and then Kristen Weber is playing violin. So I’ve got this young string section and all their friends come out. Everyone is getting it. It’s going over wonderfully. People are singing along. They’ve bought the album and they come back to see us. I haven’t felt like this for as long as I can remember. I’m always on stage playing someone else’s music. You strike me as someone who always has a lot of irons in the fire. What else are you working on these days that has you feeling excited? ​I’m always looking for a chance to get the pedal steel out there. I’ve taken that up more recently in my life and that’s another thing that excites me in music at the moment. I’ve been getting to play steel on a whole variety of stuff. Buddy Miller has used me on some of his productions and my son Austin has a band and I play with him. Then Joe Pisapia has a cool band I’ve played steel with, and we’re going back to The 5 Spot and doing a residency in February. When I’m not doing this new band and playing the new record, it’s just waiting to see what kind of variety is going to come in this week. Nashville has every kind of music going on, and it keeps things really fresh.